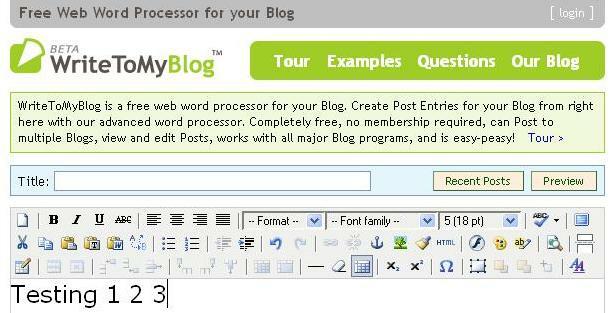 WriteToMyBlog is a very full featured web-based blog word processor with tagging and trackback capability included. It's easy to use, and your username and password are stored in your browser so you don't have to re-enter them every time. 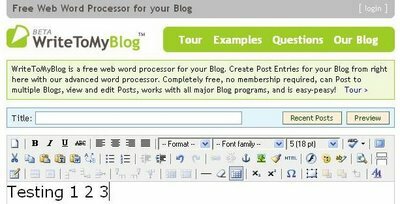 It cleverly uses your blog's username and password to "create" an account for your old posts on WriteToMyBlog. Blogger, WordPress, TypePad, and Movable Type are supported, and you can even post to all of them at the same time. There are some features that are missing though. You can only add a link to an image you want to post, not upload it. It's also missing the ability to notify ping servers of a blog update that something like Microsoft Live Writer has. Nevertheless, WriteToMyBlog is significantly more feature rich than some competing standalone and web-based blog publishing services so it's definitely worth a look.